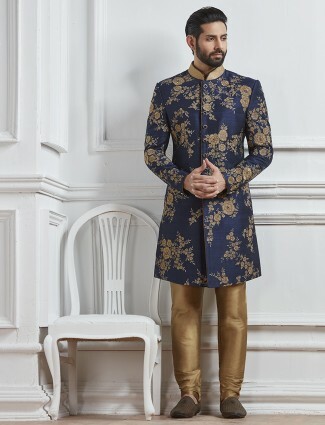 Charm out the new grace of mens wedding wear with the Indian & western twist merged to perfection of a designer line of Indo westerns for men proudly available at G3 Fashion. Your chance to shop for your modern style to dress at weddings, parties, festivals and celebrations with G3+ Indowestern for men. Fashion among men has become more important for all kinds of occasions. 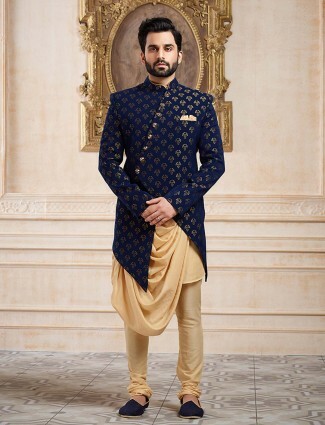 Especially if we can see the trends of Men’s Indian wear outfits, from Wedding wear to Party wear their choices have gone more stylish from traditional to a mixture of traditional and modern as the indo western for men. 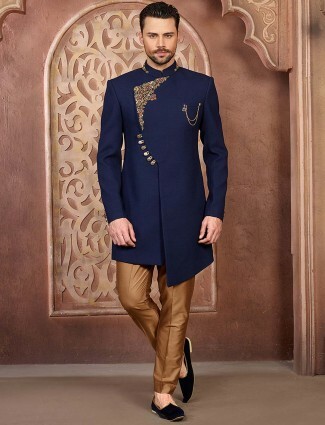 The current trend of Indo western menswear has just got so many categories linked to it from Coat suits, sherwanis to Kurtas and bottoms all indo western ethnic wear style for men. 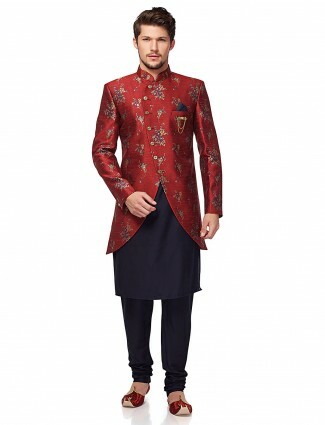 We at g3fashion.com wanted make this one stop shopping place for mens indo western outfits online with all these different categories to choose from. We bring you a range of indo western dresses for men in different sizes of 38 to bigger sizes and also custom made indo western dresses. 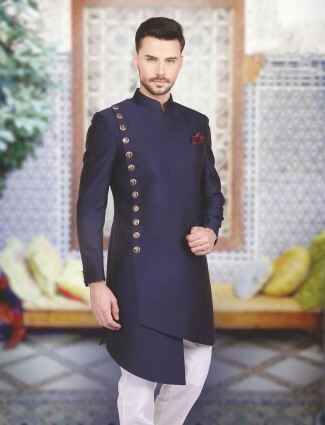 So if you need to look extra special for your occasions or say just need some extra attention, our mens style range of indo western outfit choices will be the best choice. 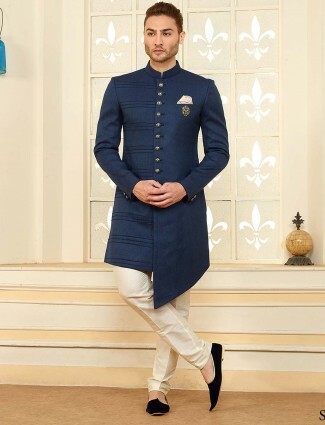 You can shop for indo western for groom, or indo western for groomsmen and also indo western wear for festivals, parties and any other different needs. We also bring some of the best services when you shop online for mens wear at G3fashion, we give you customised tailoring options, alterations, or also suggest you different fashion tips for your shopping. Get matching accessories with mens indo western like, stoll or dupatta, a turban or even long mala to match your Indian ethnic look for weddings. 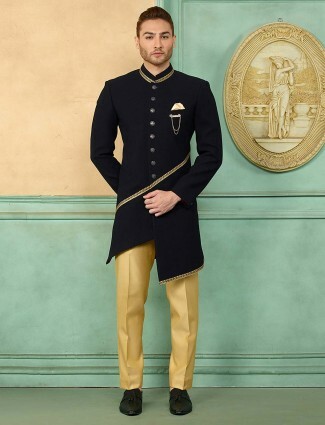 Most of the times we men look for comfort and elegance when it comes to weddings, and our collection of indo western sherwani online and also the indo western suits for men will be right on trend of fabric, color, pattern and embroidered look. 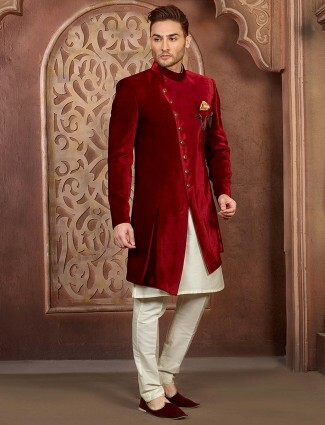 Take a look at the trending styles of indo western sherwani for marriage. 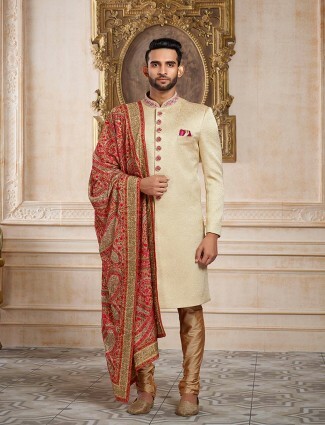 Shop your groom’s look at g3fashion for indo western which are in Silks or Imported Solid fabrics. 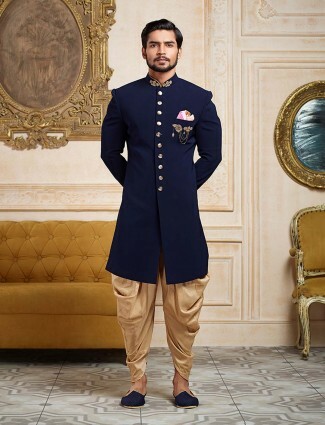 Get a look like celebrity indo-western sherwani in thread embroidered sherwani paired with a nice jodhpuri or dhoti look. 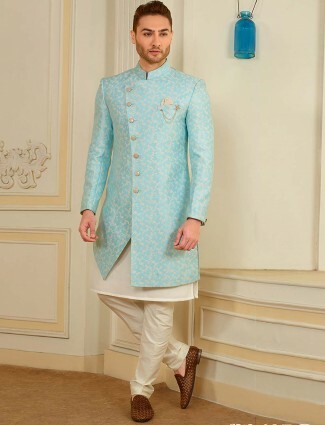 Try a more stylish impact of look with a 3 piece indo western sherwani with kurta and pyjama and a shorter jacket sherwani over it in a opened style. 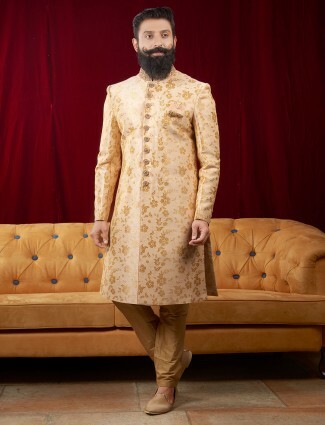 This is are super comfortable for Grooms to carry at different wedding occasion or reception too. Get that exclusive white indo western sherwani online win plain fabric look or embroidered weave work look at G3 fashion. 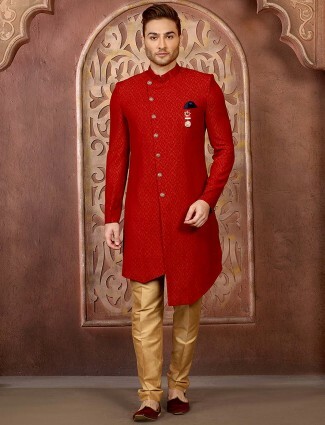 Shop for Red or Maroon Color Indo Western for men to wear at wedding ceremonies. 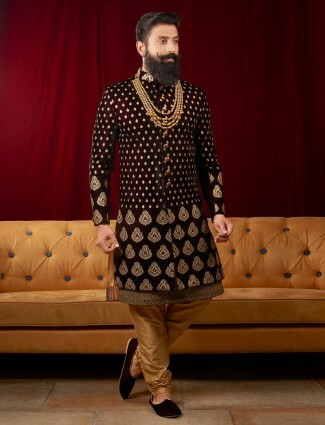 Or Try the Black Indowestern for men in a high low front opening style for weddings guest or groomsmen indo western choices. 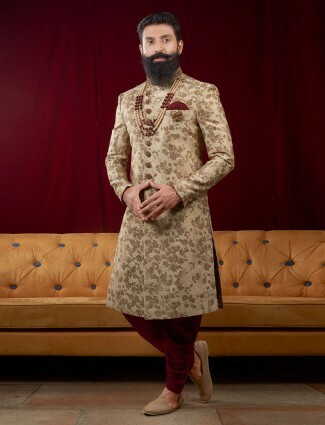 We sure you will come across your best indo western sherwani for groom and also for wedding guests at G3+ fashion online shopping site. 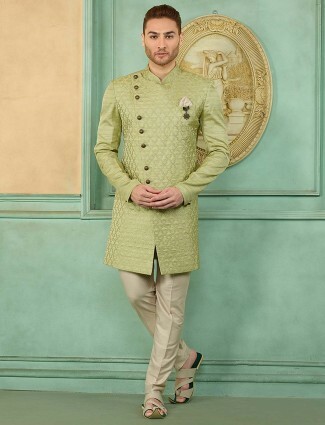 Choose a more classic modern vibe for weddings with our collection of jodhpuri indo western sherwani, which comes in a jodhpuri pant, mandarin collar short sherwani jacket. These are also available in embroidered fabric or plain solid fabric choices to match your taste. Indian festivals are a time when even men want to dress traditional and stylish at same time. Their option is to choose indo western kurta pajama or the indo western in 3 piece look which may have a jacket over the top or a waistcoat look. The new range of indo western kurta also are perfect for men to try a different look in simplicity for pujas, festivals like Diwali, Raksha bandhan and others. 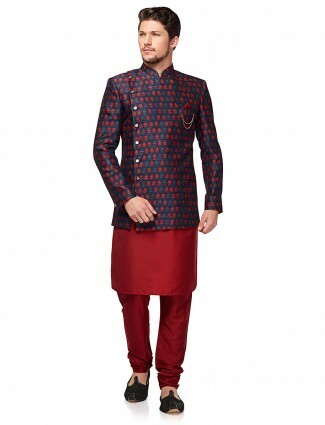 We bring latest colors and patterns of mens indo western kurta collection in all sizes for you to shop online. 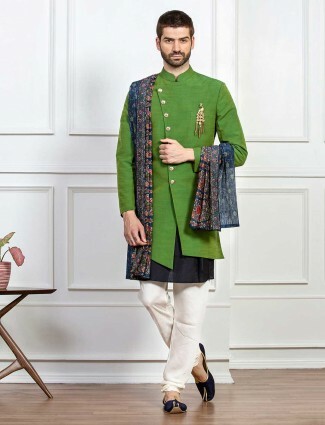 Choose the new look of Indo western kurta and Jacket style, which may be a shorter jacket which is buttoned only at top and has a diagonal opening, so the kurta is visible or may have a blazer style jacket to be worn over your kurta pyjamas. 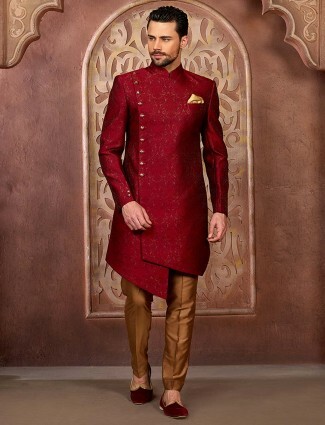 The even more styles indo western kurta and nehru jackets or waistcoats are the first choice of celebrity looks too. From Ranveer Singh too Shahid Kapoor being top trend setters of Indo Western Kurta Outfits to follow and you can find these top trends on g3fashion.com for online shopping. Our Range of indo western ethnic wear is available online in different prices from budget price to higher sherwani ranges for occasions. 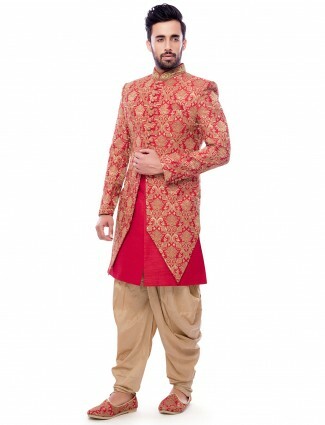 Choose your individual style of indo western for men online only at best prices at G3Fashion.com and get your products delivered to your worldwide.